To fold tortillas, fold in both sides of circle about an inch and then hold that while you roll up from the bottom. Place fold side down in a baking dish. Once all tortillas are in baking dish, top with sauce, sprinkle with cheese and cilantro and bake for 25-35 minutes covered. Uncover for last 10 minutes. It is ready when cheese is melted and sauce is bubbly and heated all the way through. 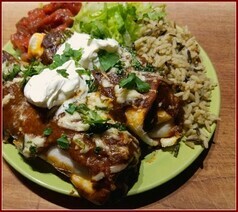 Serve with salsa, sour cream, rice and chopped greens. Cool and serve with sour cream.